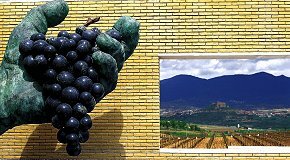 I recently made a flying visit to Spain to see the recently opened Museum of Wine Culture in the heart of Rioja, just next to the small town of Briones. I must have visited half a dozen wine museums around the world. Unfortunately, most are depressingly awful: badly lit spaces filled with rusty old machinery and shop-window dummies carrying bunches of plastic grapes. Not so this significant new museum, opened by King Juan Carlos. If Rioja is on your travel plans, all I can say is do not miss this astonishing new museum. 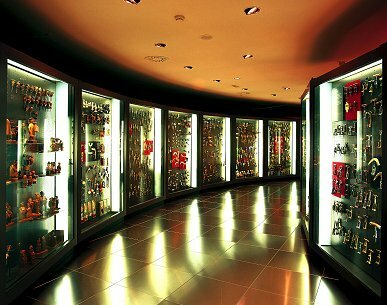 It’s crucial difference is that it is a museum of wine culture (not just a museum of wine) and is the product of 40 years of obsessive collecting by the Vivanco family, owners of the adjoining Dinastia Vivanco wine estate. Most important of all, it is a stunningly high quality realisation: a beautiful contemporary building and a museum collection spread over four huge floors of a purpose-built space that is absolutely world class by any standards. There are terrific interactive displays that really bring winemaking, wine aromas and flavours, barrel and cork-making to life. A big screen animation of the fermentation process, seen at molecular level from within the tanks, pipes and barrels, is brilliantly done. Left: 4,500 corkscrews anyone? 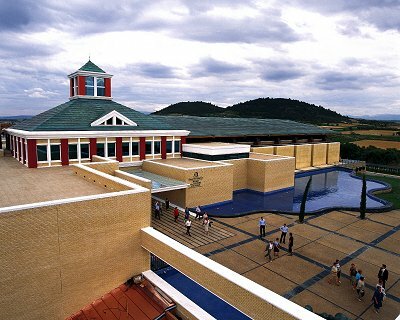 Conservatively, it will take you three to four hours to go round this massive, themed collection, and it would be easy to make a whole-day excursion if also visiting the winery and tasting wines at the tasting bar, and especially if you include lunch at the superb restaurant (more later). 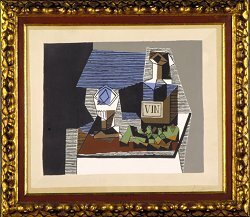 The third-floor gallery of wine-related art and artefacts is perhaps the jewel in the crown, from an Egyptian frieze, to a Roman burial sarcophagus, to Disney drawings, to original Picassos. For those with a real academic interest there’s also a historical literature archive (by appointment) that contains 5000 books on wine, including many extremely rare and valuable manuscripts from the pre-printing press middle ages. But there is even more to this amazing place: outside is ‘Bacchus’ Garden’, a lovely landscaped and sign-posted area where 220 different vine varieties are being grown. Go along in late summer and you can have a virtual world tour of the wine world’s grapes. There’s a bright, airy and modern coffee shop, wine-bar and outside terrace as part of the museum, but best of all for a foodie like me, there is also a seriously good restaurant. 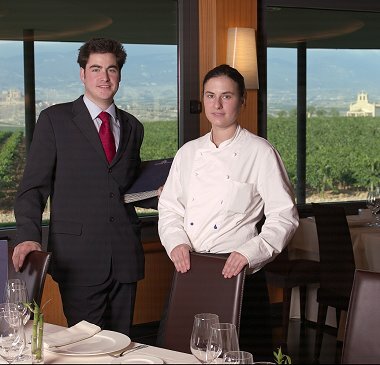 Jon Zubeldia and Maribel Frades are at the helm, coming to the museum restaurant from two of Spain’s most respected restaurants, El Bulli and Arzak, both of which have three Michelin stars. Clearly the intent here is to achieve something of those levels in a beautiful dining room overlooking the vines and distant Cantabrian Mountains. My meal included one the best dishes I have ever eaten – a bowl of creamy couscous richly flavoured with herbs, Blewit mushrooms and smoked Idiazabal (a local sheep’s cheese), topped with slices of caramelised foie gras. I realise that some may think I am gushing in my praise of this new museum. But all I can say is go there if you have the chance. It is the pride, confidence and quality of execution that astonishes, the breadth and significance of the collection, and the unflinchingly beautiful style of the whole project that is just a joy for the wine lover. Goodness knows how much the project must have cost the family, let alone amassing this collection over 40 years. But the museum if truly a gift to the world of wine from the Vivanco dynasty.